Looking for a new lawn sprinkler? Whether you're gardening or caring for you lawn, Vocti lawn sprinklers will get the job done! 1.We let our manufacturer to make this sprinkler with high quality thick ABS material, thus enhance the stability of this sprinkler, ensuring it will not tip over or move around when watering. 2.Some customers need a sprinkler not just because of it is a sprinkler, but also it is a water playing toy for children. If the water pressure is enough , the water comes out from the sprinkler will be very strong. Your kids will be running around having fun with this item. 3.We package a hose connector for you. If your hose is a traditional, you will need to accatch the connector to the sprinkler.If your hose is just the normal hose like most of the Americans' hose, you can connent to the sprinkler directly. You need no worry for this problem. We provide two kinds of sprinklers for you, as well as a free hose connector! **Adjust to 45°: high speed mode, for efficient watering of extra-large spaces. The watering diameter up to 33 ft.
**Adjust to 90°: low speed mode, for watering tall plants. The watering diameter up to 26 ft. It was designed if only a certain part of the garden needs watering, such as flower beds that get the most sunlight. **Adjust gentle mist for followers or powerful mist for arbor. **Adjust watering angle, any angle you want. 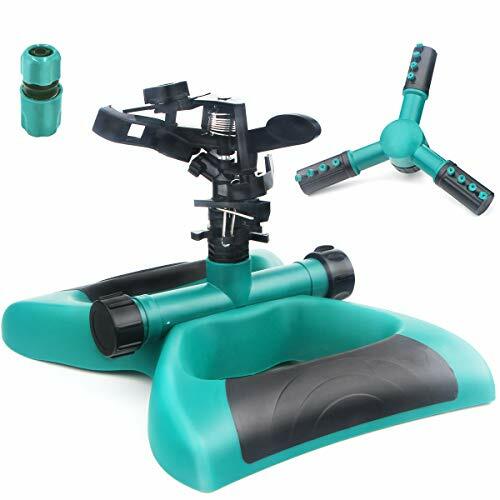 ☀【3Arms Sprinkler & Impact Sprinkler & Hose Connection Set】-- The 3 arms lawn sprinkler, each has 4 diffuser angle nozzles, can be adjust from 45°to 90°. The impact sprinkler has farther spray distance and huge impact spray! You will also get a hose connection for free! 【Automatic Rotating & Easy to Use】--Automatic constant 360 degree rotating spray without other auxiliary power equipment. Just by household water supply pressure. The garden sprinkler equipped with a quick connect adaptor to start watering instantly in seconds. 【Speed & Range & Angle Control】--Put water exactly where you want it, this is just the amazing sprinkler you are looking for! Adjust the nozzle to 45°: high speed mode, for efficient watering of extra-large spaces. To 90°: low speed mode, for watering tall plants. The watering diameter up to 26-33 ft. The Coverage can be up to 3200sq.ft for your whole yard. You can also Adjust the impact sprinkler to control watering distance and mist. 【Effective and Energy Saving for This Hot Summer 】--The water sprinkler irrigation system for garden takes better care of each piece of soil moisture that provides even coverage, efficient and quick, saving you time and water. 【Multi-Purpose with Good Service】-- Our water sprinkler can be used for lawn, agriculture, nursery and grass irrigation, compatible with home, garden, yard, roads, greenhouse watering and cooling. We also provide good after-sales service. If you have any questions about the product, feel free to contact us at any time, we promise 30 day money back and lifetime quality warranty. Your purchase will absolutely be risk-free. If you have any questions about this product by Vocti, contact us by completing and submitting the form below. If you are looking for a specif part number, please include it with your message.